Ahhhh, the hip, cool, swinging 60s! 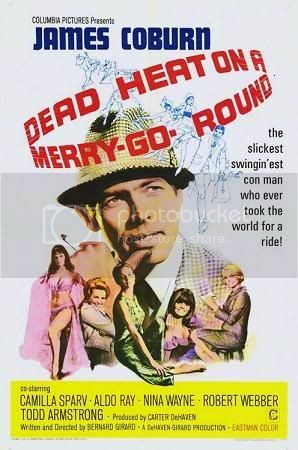 Dead Heat on a Merry Go Round is a great example of what was right about movies in the 1960s. 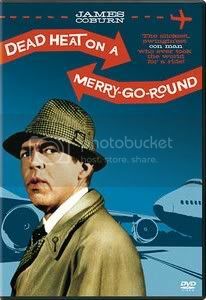 First off, casting James Coburn in the lead as a suave, smart, clever con man and thief was a stroke of genius. He was still young enough to carry off the role perfectly, and his charm and appeal was exceptional. He could be tough, but he could also be clever. In this role it's more of the latter rather than the former as his character is extremely confident, and extremely clever. The movie centers around Eli Kotch, a prison inmate who charms his way out of prison thanks to a female psychologist whom Eli charms and seduces - and then fleaves flat once he's free. Eli knows of a set of blueprints to the band at LAX airport, and he's got a plan to get in and out of the bank without getting caught or identified. But the bank caper doesn't take place for a while. Dead Heat on a Merry Go Round takes it's time getting to the payoff. Along the way Eli with assume different identities to score smaller heists from wealthy people whose maids he charms. He even goes so far as to marry one of them! It's all in the name of making this one big score a reality. Not only is Coburn charming and suave as the con man, but the movie itself is smooth and easygoing. It moves at it's own pace. By today's standards I guess that would mean it moves a little slowly, but when judged on it's own merits Dead Head on a Merry Go Round has a pace that fits the story and characters perfectly. As for the rest of the supporting cast all you need to know is that three of the actors were guest stars on the original Star Trek series. They each had guest starring appearances on several TV shows during the 60s and 70s. Good, solid actors all. Just no one above average. Which, given the movie's laid back atmosphere works just fine. The movie is mildly amusing (it's defnitely not laugh out loud funny), and it has a few mildly exciting moments - all in the right spots to keep the thing from dragging. It's entertaining. It's fun. And the ending has a brilliant payoff, kind of a poetic justice that you just won't see coming. It's played subtly, but it's brilliant and just right all the same. Sony's DVD of Dead Heat on a Merry Go Round is just fine. The color saturation is good for a 1966 film, and the amount of grain and print damage is all fairly minimal. The grain is natural (a fine grain), and the print is in good shape. The DVD authoring itself seems to have been done well, if unspectacularly. All in all a good way to spend a Friday or Saturday night.